Ronan Collins is a twenty-year-old young man, living in Dublin with his mother. His life changes when he received a notary letter informing it that his father is dead and Ronan is his heir. Ronan’s disconcerted by this letter since he never knew his father because he’d abandoned his mother when she was three months pregnant with him. Ronan decides to see what this mysterious father wants to offer him in his death. For that, he will have to move at Amsterdam and work with Lucas, his father’s assistant. What’s supposed to be a walk in his father’s life will become the journey of Ronan’s life and future. 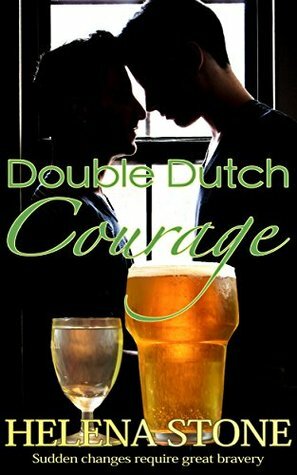 Double Dutch Courage is my first book from Helena Stone the author. This book is a quiet journey in Ronan and Lucas’ life. When Lucas is scared for his future since everything will depend on what Ronan will do, Ronan is scared of himself. Saying that Ronan is in the closet is an understatement, the guy is so deep in the closet that he often takes the tea with Asla. But I understood why. He’s scared of hurting his mother—plain and simple. Otherwise, Lucas hasn’t a problem with his sexuality, but he refuses to take advantage of Ronan. Together, these two young men will get to know each other as work partners, then friends and then lovers. They also learn more about themselves. I liked the relationship between Ronan and his father. (Yes you read me correctly, and no, I didn’t forget what I wrote above). Even if Ronan and his father are strangers and never saw each other, they are similar, more than what Ronan thinks. First, Ronan is the spitting image of his father. Second, they share the same creativity and field of work. Finally, they’re both gay and they’d both struggled with their sexuality. I liked this kind of mirror effect between father and son. I can’t say that I disliked the book, but I can’t say that I liked either. This book wasn’t for me. I’m use to books with a faster pace (it matches my personality I think), so sometimes the book couldn’t hold my attention. Besides, the characters were kind of one-dimensional, and it missed something for my taste. But it was well written, the author has talent, and her descriptions of Amsterdam was so vivid that I had the feeling of being there with them seeing the colors and smelling the odors of the beautiful city. It’s 3 OptimuMM for the Irish and his Dutch lover!